I’ve had the great privilege the last few weeks of getting into the classroom with kids at my local elementary school, and online with some awesome homeschooling families, to share my love of coding and give them a chance to try it for themselves. The majority of the second to fifth graders I’ve met so far have never played with code, which means we are starting with basics. And it is AWESOME! Even if you have been playing with code for years, there is always something new to learn. And my own journey (teaching adults and now kids about coding) has shown me that I may be “the teacher” but I, too, walk away from sessions having learned something new. New learners ask lots of questions and challenge us (in a good way!) to boil an idea down to its essence as we endeavor to explain it, or they force us (in a good way!) to look at something from a different angle and consider possibilities. There are often multiple ways to approach a problem with code, and someone looking at your code with fresh eyes may see something you didn’t see before, or may have a great addition. Debugging your code is such an amazing learning opportunity. But debugging someone else’s code? That has really helped me level up. That is one reason I talk to my students about pair programming early. I ask them to be my navigator as I drive and, as they progress, to turn to each other for help before turning to me. Building muscles, including the debugging muscle, is hard work and sometimes uncomfortable. But that struggle and perseverance is necessary to grow. I relish seeing their excitement and their creativity, but what I love most is seeing that light bulb turn on and the sense of accomplishment when they debug their code. 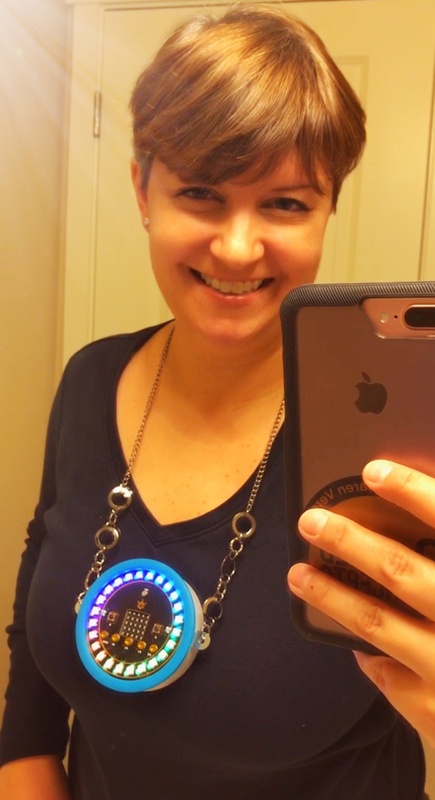 I practice that same persistence when I’m writing lesson plans, creating projects, crafting presentations, editing videos…or trying something completely foreign to me, like playing with microcontroller development boards, like the BBC micro:bit, and robots. It has lead to long days and late nights, and lots of FUN! You can follow me on Instagram or Facebook to keep up with my other fun experiments. And happy coding!